Tomorrow (Feb 16) starts Year of the Dog. Tonight in China everyone has gone home to be with their families and depending on where they are might be eating dumplings or fish or other traditional celebratory dishes. I am just celebrating being able to cook, period, so i whipped together two of my favorite Chinese dishes and experimented with a third. 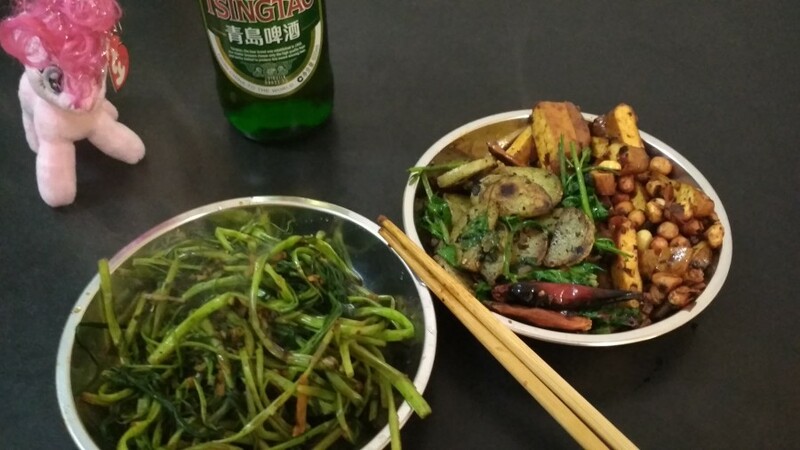 On the left is a plate of water spinach, which is known in Chinese as 空心菜 (kōng xīn cài) or "hollow vegetable". I know the Cantonese call it "ong choy", though i am not sure which characters they use to spell it. It's one of my favoritest favorite dishes of all time, and from what i understand is popular in rural areas all over South East Asia, because you are basically just eating weeds. You can use any green veg that has a hollow stem - even regular Western spinach is acceptable, if a little limp. Usually it's made with plenty of garlic, oyster sauce and maybe some salty fish. I tossed mine in the wok with a splash of dark (mushroom) soy sauce, a bit of sesame oil, a few cloves of diced garlic and bit of water. On the left half of the second plate is the 干煸香辣土豆 i mentioned in the last entry. Take one small potato and cut it up, then toss it in a wok with no oil, no nothing. Keep tossing it till it starts to brown. Then add dried chilis and Sichuan peppercorns and a tiny drop of peanut oil to help transfer the flavor. No problem if you don't have the peppercorns, but that 麻 (má) numbing flavor is nice. At the end i also tossed in some cilantro. I decided to also cook up some tofu for extra protein. I started with 豆瓣酱 (dòu bàn jiàng), which is a fermented bean and chili paste they use in Sichuan cuisine. It is extremely, ridiculously salty and i think i put in too much, but i'm still figuring out good ratios for my Sinicized (read: smaller) appetite. I tossed some peanuts in and let it go for a while then added Sichuan peppercorns and the dry tofu (豆干), which has a similar chewy consistency to dried shiitake mushrooms but with a less meaty flavor. Yum. Companion beer is Tsingtao. Over in Nanshan District, Budweiser was the beer of choice - available everywhere and cheaper than Tsingtao. I tended to stick with a beer in a green can called 珠江啤酒 (zhū jiāng pí jiǔ) - literally Pearl River Beer. It's a local brew and very cheap, which is exactly what i look for in my booze. Unfortunately here in Luohu District it's quite hard to find. Also in Luohu, Bud is priced more like a "premium" beer, so Tsingtao it is.